Leading skin and body care brand NIVEA introduces a new product - the Nivea UV Whitening Serum, the Philippines' first and only intensive whitening and repair serum for the body. "The answer to lighter, fairer skin, once and for all." I've heard about serums for the face; in fact, I've used a couple already. But serums for the body? Well, this product is the first I've seen. 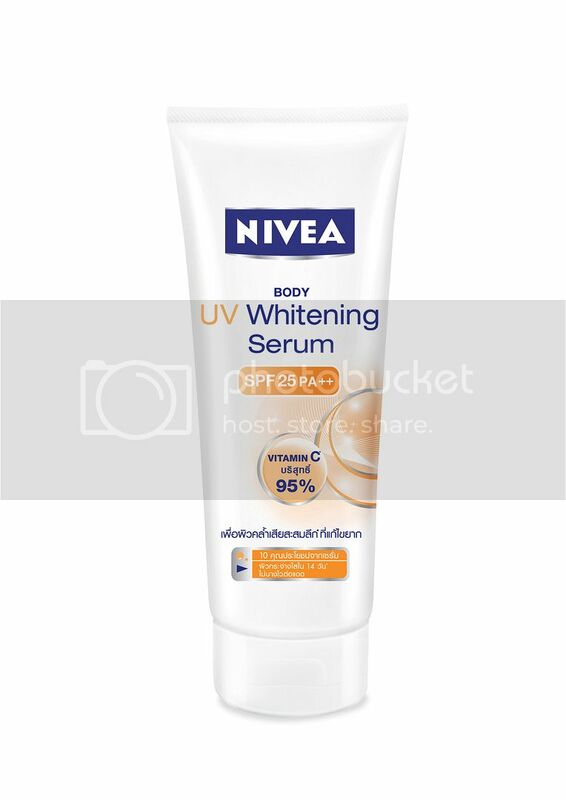 This product is Nivea's attempt to provide longer-lasting whitening products that not only whitens but also makes skin healthier and more vibrant. The Nivea UV Whitening Serum claims to contain Vitamin C, nature extracts, UV filters and Hydra IQ that help even out skin color, whiten and moisturize the skin for a healthier look in just 14 days, with results that visibly last. This whitening serum claims to give the following benefits. Effective kaya siya Ms. Aya? I've tried a LOT of whitening lotions but none of them worked for me! :( Ombre parin ang peg ng aking skin tone.